Contrary to what you may have heard, the Protest Camp is still up, and the Protest Continues. Yesterday, a big contingent of SRD officials, Spray Lake Sawmills and contractor personnel, along with a couple of RCMP officers came to the site. The logging equipment was fired up. 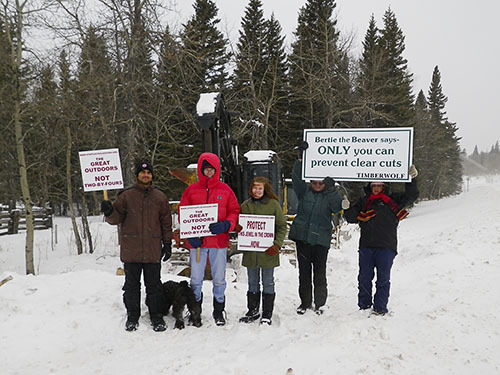 We called out for help, and a goodly number of our supporters showed up, as did the Pincher Creek Voice, and Global and CTV. Telephone interviews were done with CBC English and French. Three protestors stood in the way of the machine, and said they wouldn’t leave. The SRD officers conferred, and then, just around noon, SRD, Spray Lakes, and the RCMP all left. One RCMP officer stopped this morning to see how things were going but, other than that, we haven’t seen any other officials. More soon… Gotta get back to the site. This entry was posted on Wednesday, January 25th, 2012 at 1:29 pm and is filed under Uncategorized. You can follow any responses to this entry through the RSS 2.0 feed. You can leave a response, or trackback from your own site. You all are doing awesome work, and special thanks to those who stood in front of the machine! I’m thinking of you all day every day, hoping for the best and sending good vibes your way. Love your conviction,too bad its against a RENEWABLE resource! Please know, not everyone believes logging is evil.My grand kids will see a beautiful young forrest where the proposed cut blocks will be.Trees grow back.Hope your protest fails! Dave, the trees might grow back, but not in our lifetimes. 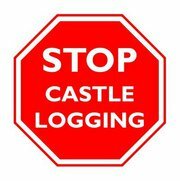 In the meantime, we’ll have reduced the viability of the Castle as core Grizzly Bear habitat, we’ll have damaged its recreational value, we’ll have increased the damage to an already battered watershed, and we’ll have damaged the local wilderness-based businesses. It will also be another environmental black eye for the province. And all for what? A return to the provincial treasury that’s so small that it won’t even pay for the damage the trucks will do to the roads, and a few fence posts and wood chips.